New Hart Shaffner & Marx Spring Suits and Sport Coats! 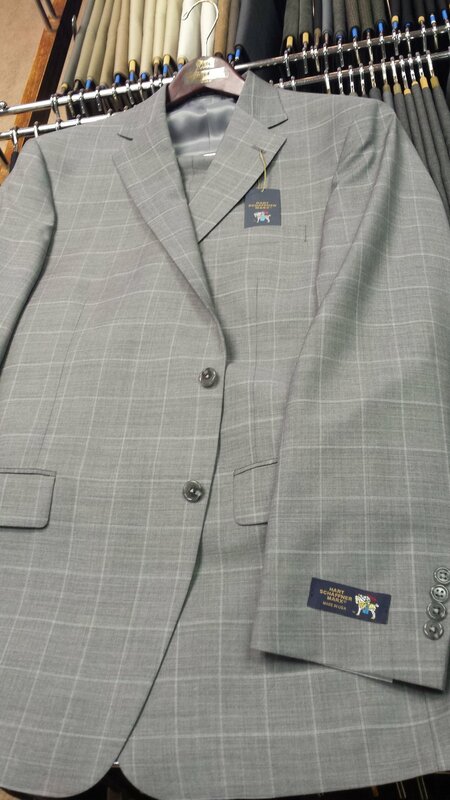 We just cracked open our first shipment of spring suits and sport coats from Hart Shaffner & Marx! We have two new very contemporary additions to our suit selections. The first is a light grey suit with a white windowpane in a beautiful lightweight wool. The second suit is a lighter shade of navy with a very fine light blue check pattern. Suiting trends today suggest brighter and bolder combinations of colors and patterns on suits, ties, shirts, and even socks. These suits represent a middle ground between the very traditional and very contemporary, so you can dress them accordingly to your comfort level. Sticking with the growing trend of dressing down a blazer with a pair of nice jeans, our new sport coats can be just as easily worn with your favorite sport shirt and pair of jeans as it can dressed up with a tie and dress slacks. The first two sport coats are a solid light grey, and a very bold bright blue. The fabric of these blazers are woven in an updated method of a hopsack weave, giving the fabric of the coat a fantastic textured look and an amazing feel. These first two styles of these coats we have featured in past seasons, but are back due to popular demand. The last sport coat is grey-blue with a navy plaid, it is an extremely versatile coat and a perfect coat to wear dressed down with your favorite pair of jeans. Newer PostNew Nike Golf for Spring!